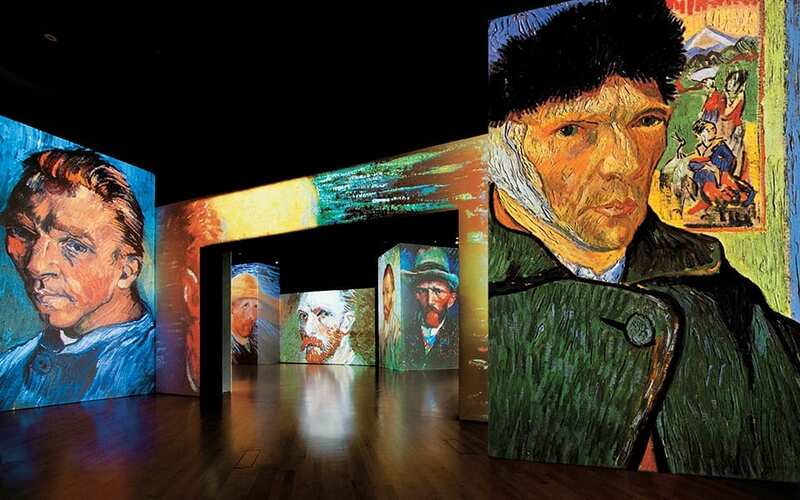 Van Gogh Alive’s website heralds it as “The new way to experience art.” If that’s accurate, from now on we’ll be forced to experience art as a sensational display of sensory flamboyance. 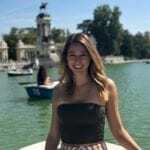 Though you are welcome to walk around the exhibition space during the show, the crowd in Alicante flocked to the provided benches and brightly colored beanbags. To wander in front of them would feel akin to wandering between the screen and the audience at a movie theater. We watched in passive inactivity as the dramatic classical music began, and a short passage describing Van Gogh’s early pieces introduced the first of six acts. 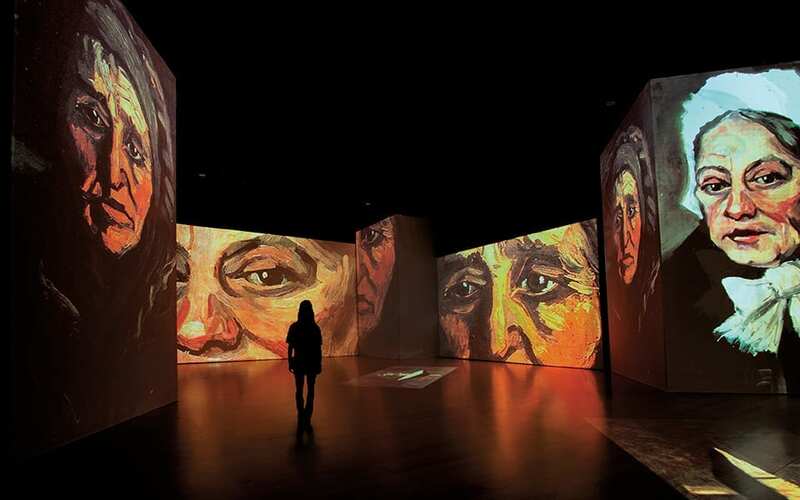 The “powerful classical score” carried us through projected images of Van Gogh’s work. Panels were arranged on all sides so that the enthusiastic viewer must constantly turn their head to take everything in. Sometimes each panel showed a different painting, while at other times, all were devoted to a single piece (as was the treatment for the famous Almond Blossom, multiplied into a dozen mirror images). The paintings were rarely shown in their entirety, as each panel zoomed in to focus on one area at a time, or slowly panned from one side of a painting to the other. 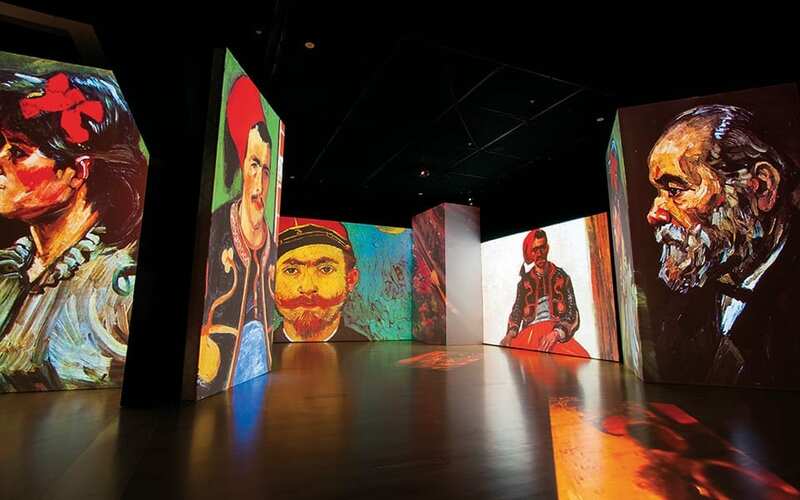 The context did not exceed a short paragraph at the beginning of each convenient chapter Van Gogh’s career had been sliced into, a biographical sentence or two combined with a basic characterization of the pieces produced during each period. The whole thing left me wondering how the dynamic, moving display enhanced my experience. I found myself wishing more than once that I could just view a painting in its complete form, and that it would hold still long enough for me to direct my attention autonomously. The production value of the projections, screens, lights, and music seemed demonstrative rather than artistic. A closer look at the website reveals an organization called “Nomad Art Multimedia”, a “full-service pyrotechnics and special effects company” that offers “large-scale 3D video building projections, water screens, dancing fountains, laser shows” and more for “corporate and private VIP events.” No artist or art historian is credited with the design of the event, fueling my impression that the whole thing is just a gimmick. To its credit, a friend I attended the show with mused that she had enjoyed it, despite typically disliking museum exhibitions. Finding new and exciting ways to introduce traditional art is certainly a worthwhile exertion, and perhaps in that endeavor, the exhibit’s creators must be granted success. 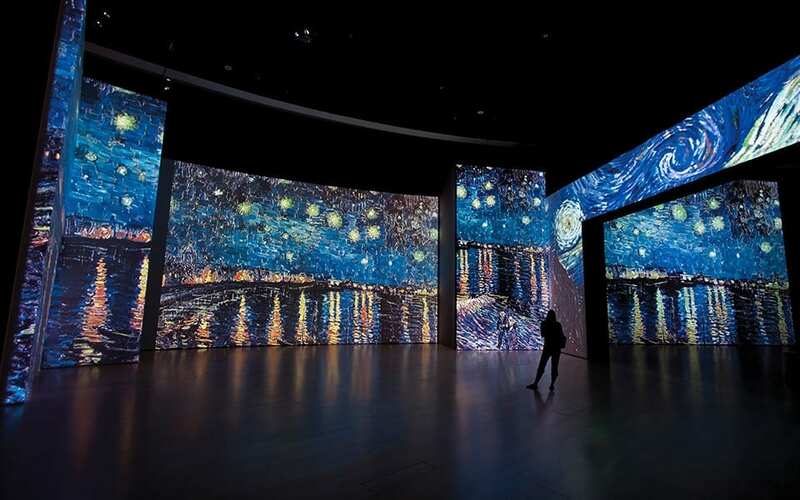 On the other hand, I’m not sure how many people who have no interest in Van Gogh or his paintings would pay to see them projected onto screens for an hour, so it seems doubtful that they are the intended audience. While technology can (and arguably, should) certainly be incorporated into art exhibitions and museum installations, this exhibition seemed more like a capitalistic effort to combine art and technology for technology’s sake, rather than marry the two in any meaningful way.